Suddenly on October 2, 2005 we lost our beautiful boy Bo, who we adopted on July 17, 1998. We adopted Bo when our girl Ginger crossed the bridge in November of 1997. 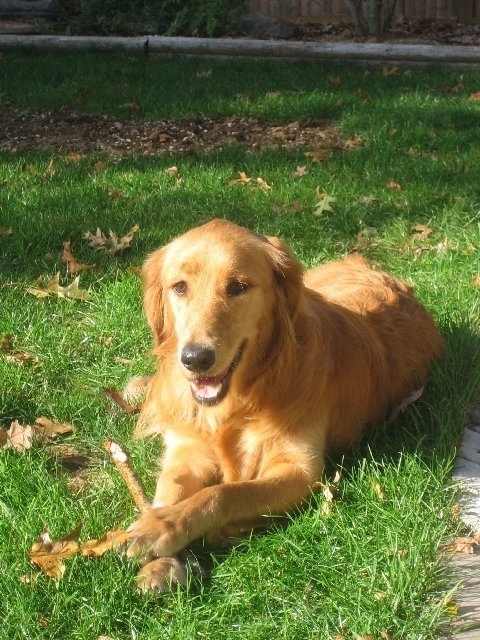 We first became aware of LIGRR at the Bellmore Street Festival and we always knew that adoption would be the way we would have a new Golden in our lives if something happened to Ginger. We always wanted to give to another Golden what our first spoiled one had, in her memory. Then came Bo. He came from the Bronx and was abused. He was aggressive, scared and untrusting (wouldn't you be?) He was so beautiful and just wanted to be loved. He was the love of our lives and was such a good boy, even if for a short while. After he crossed the bridge, our hearts were broken and our lives were empty without a Golden in it to brighten the days. Once again I turned to LIGRR and there was Diesel. Not quite as regal as Bo and a little lanky and clumsy, but what a big loveable baby he is. We call him our "Scooby Doo" because he just looks at you as if to say "Aw Gee Mom". Diesel settled in within hours of arriving and filled us with joy and laughter immediately. He has matured into quite the handsome young man and is so well behaved (most of the time). We've added another dog to our brood and have three now, all of whom take up most of the king size bed, but we wouldn't trade it for anything. There's nothing like a Golden in your life to make you smile. Thanks LIGRR for all you do for all the wonderful Goldens that need us.